This is an interesting job. An 1875 Rich Lipp & Sohn upright piano. My customer contacted us to get this Rich Lipp & Sohn piano playing. Her father has been placed in a home and the piano was in her family home. My customer remembered the piano from her childhood. However dad was a Mr fix it and had done some home repaires to the piano. The tuning plank has splits in many places and the piano was untunable. So the challenge was to get it playing so it is useful. To a minimum budget. We have some boundaries as we have with all and piano repairs. This is a repair or get play. Not a full restoration so the end result will be different. 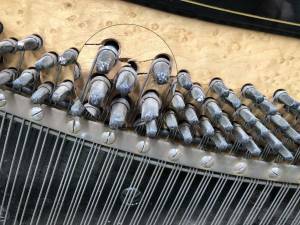 The Piano will not tuned to pitch. The Piano will only play to a hobbie level so this is not a cheep way to get an old piano for a child to learn on. We assessed the repair in December 2017 and I have just started the repair the second week in Janurary. 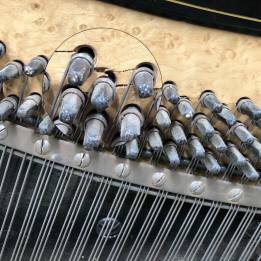 To get this piano playing I need to repair the cracks in the Tuning plank. 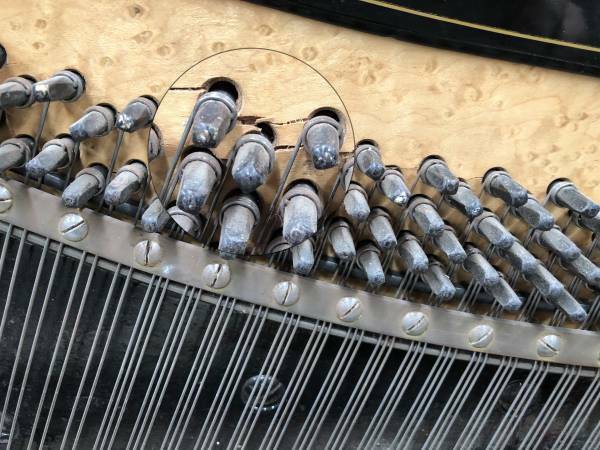 This plank holds the tuning pins that keeps the piano in tune. 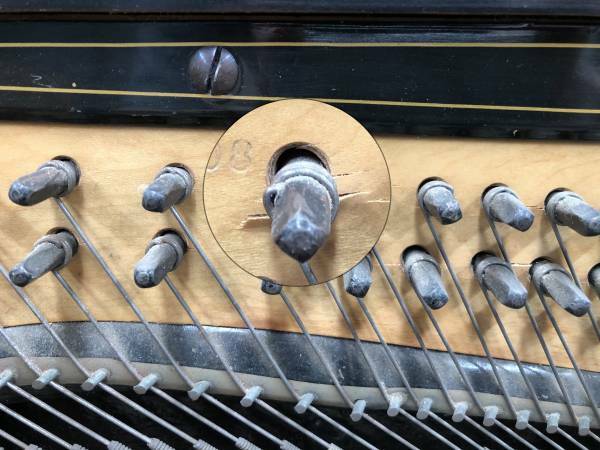 The tuning pins needs to be tight in the tuning plank to hold the string tight. One benefit on this piano is the ability to see the Tuning Plank. 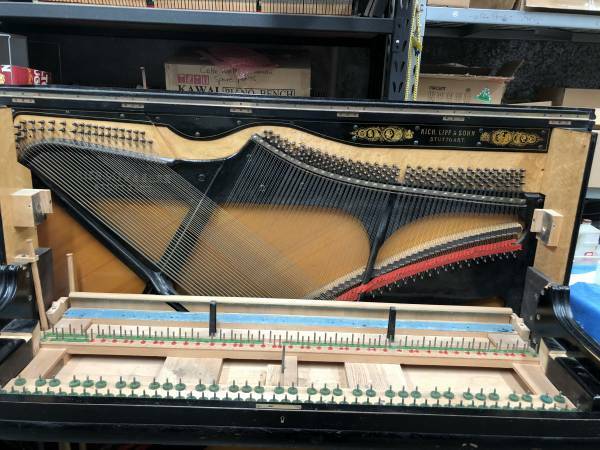 this piano is what is called a 3/4 iron frame so the frame only comes up to the pressure bar instead of the top of the piano. It’s also the reason the Tuning Pins are dragging down through the tuning plank. One of the most prominent features is the length of the bass strings. See how they are almost horizontal. This model Lipp with the extended ends has the extra long Bass Strings. This gives the piano a very deep and rich Bass. 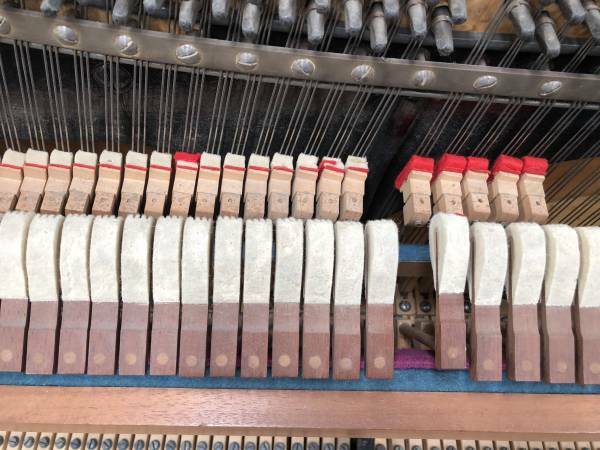 It is almost impossible to replace the tuning plank on these pianos as the ends of the piano need to be removed to get to the plank. 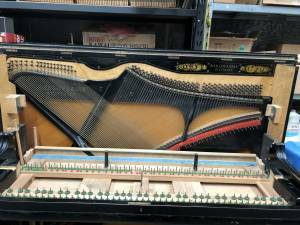 This is also a 3/4 iron frame piano. This is where the frame comes up to the Pressure Bar so you can see the black frame then the wood of the Tuning Plank and then a black plate to help hold the Tuning Plank in place. 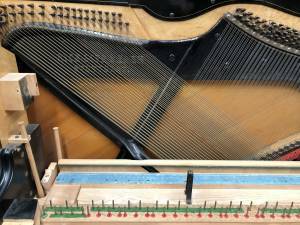 Pianos started with a Wood Frame with a plate the strings hitched onto. Then the plate was extended to the bottom of the Tuning Plank. some manufacturers still call the frame the Plate. The next inavation was the open face Full Iron Frame “FIF”. In this piano the Tuning Plank is still visible. 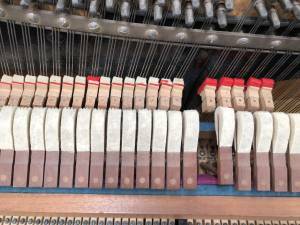 We have since finished this repair and the piano has gone to the son or grandson and they are thrilled with the repair result. I personally chuffed that we have given new life to an old piano that would have gone to the tip. My customer came to Piano Magic to inspect the piano before delivery. I played the piano for her and Diane dived for the tissue box and the tears were running strong. My customer could remember her dad playing this piano so all in all a great result.